WARNING: In The Wonder Weeks, full version, all ten leaps are described. This chapter book only describes the third leap. The Wonder Weeks Fussy and Wonder Week 12, Leap 3. 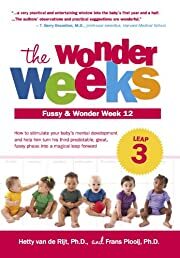 How to stimulate your baby's mental development and help him turn this predictable, great, fussy phases into a magical leap forward, describes in easy-to-understand terms the incredible developmental changes that all babies go through 12 weeks after the due date. During the first year, your baby will learn things that adults find so natural and simple that they no longer notice them. But for babies, they are the most complex things they can handle and therefore their “peak experiences.” The perception and control of “patterns” is followed by the ability to perceive “smooth transitions.” That enables the baby to move less stiff and robotic. That new ability is also reflected in the way he plays with his voice, and is the reason that babies love to play “airplane,” with them in your hands as they “fly” across the room, making steep dives and rising again. Note: Most babies make this leap 12 weeks after the due date. However, some babies make the leap one week sooner, some one week later.